Colour engraving by Josiah Wood Whymper (1813-1903) taken from 'Phenomena of Nature', published in London in 1849 for the Society for Promoting Christian Knowledge. 'Glaciers are vast collections of ice which fill up the higher valleys and occupy the slopes of lofty mountains. During summer, the heat of the sun melts a portion of snow; the water thus formed trickles through the mass and, becoming frozen at night, serves to bind it. Through a cycle of thawing and freezing the snow eventually becomes a river of ice which flows down to the lower levels.' 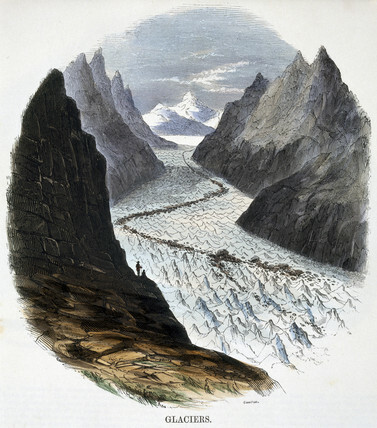 Glaciers virtually everywhere in the world have receded considerably since Whymper's today due to the effects of global warming. 'The Ignis-Fatuus, or Will-o'-the-Wisp', 1849.